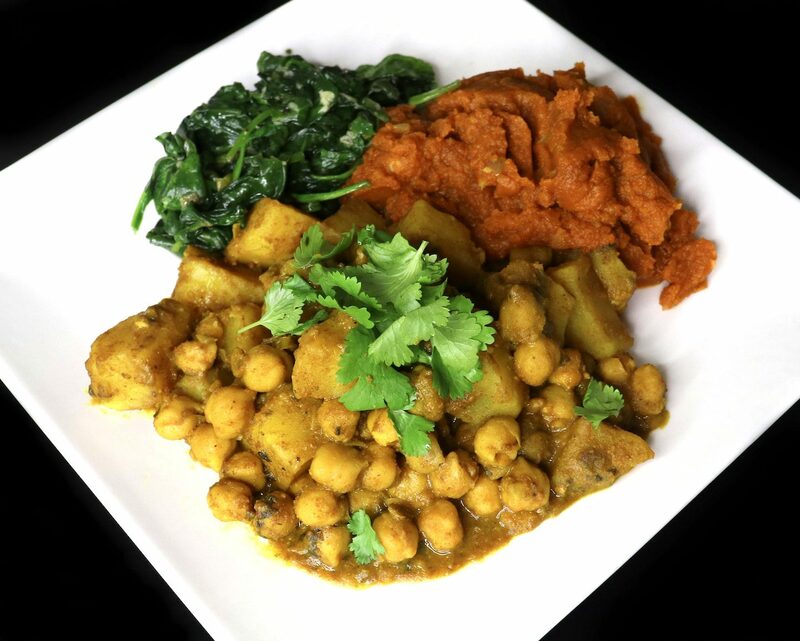 I love curry channa, or curried chickpeas & potatoes. It’s my go to filling for roti. Although these days I’m loving vegetable roti which includes bhagee (spinach) and pumpkin, along with the channa. Moving along, my Trinidadian ex’s Mom and Stepdad taught me how to make this dish along with curry chicken, some many years ago. At this point, I can whip up some channa with my eyes closed. Curry Channa is quick and easy to make, and extremely filling. It’s also Vegetarian and Vegan Friendly, and Gluten Free. 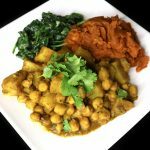 I paired the channa with coconut spinach & pumpkin, you can find both those recipes with my Tamarind Salmon Recipe. 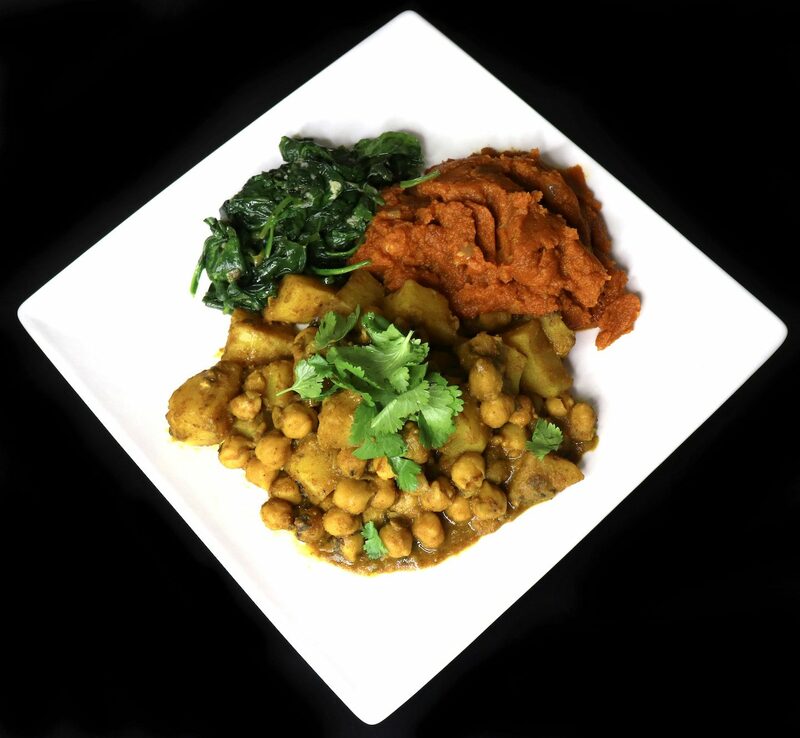 The perfect blend of chickpeas & potatoes, this Curry Channa is fragrant, flavorful and filling. Mix 2 tablespoons of curry powder with a half of cup of water to form a curry paste. Set aside. Heat the olive oil in a large pan, and add 1 tablespoon of curry powder. Fry the curry in the olive oil until it begins to brown, stirring constantly. Add the garlic, scotch bonnet pepper, shado beni and potatoes to the pan. Season with curry powder, sea salt & pepper to taste, and stir until everything is combined. Add the chickpeas to the pan and season with a pinch more salt. Stir. Now add the curry paste to the pan. Cover, and simmer on low until the potatoes and chickpeas cook down (are tender). Add more water if it boils out before the dish is done. Serve as a main dish with rice, roti or vegetables. Or serve as a side dish. If you’re unsure of what curry powder to buy, I use the Chief brand. Although the flavor is similar, cilantro is not as pungent as shado beni. So you may need to add a pinch more.